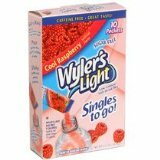 Wylers Light Cool Raspberry Si.. Plain old water just got a little sweeter with no sugar added! Take the refreshing taste of sugar-free Wylers Light Cool Raspberry flavor with you when youre on the go to school, work, the gym, in the car, anywhere. Each packet flavors a 16.9-oz. bottle of water just add the powdered drink mix, shake, and enjoy! Case includes 12 " 10-ct. boxes of Wylers Light Cool Raspberry Singles to Go. Plain old water just got a little sweeter with no sugar added! Take the refreshing taste of sugar-free Wylers Light Cool Raspberry flavor with you when youre on the go to school, work, the gym, in the car, anywhere. Each packet flavors a 16.9-oz. bottle of water just add the powdered drink mix, shake, and enjoy! Case includes 12 " 10-ct. boxes of Wylers Light Cool Raspberry Singles to Go.